My childhood was spent mostly in a small town in southern part of Peninsular Malaysia. The "festive" atmosphere in small towns during and before Chinese New Year are so much stronger in comparison to cities. The elderly in families will start making types of New Year cakes/Kuehs weeks before Chinese New Year. This Nian Gao/Sticky rice cake is one of them. My grandma was the one that makes this cake for everyone in the family, she will stayed up all night to watch the fire. Every steps of making this cake is manual and rigorous. 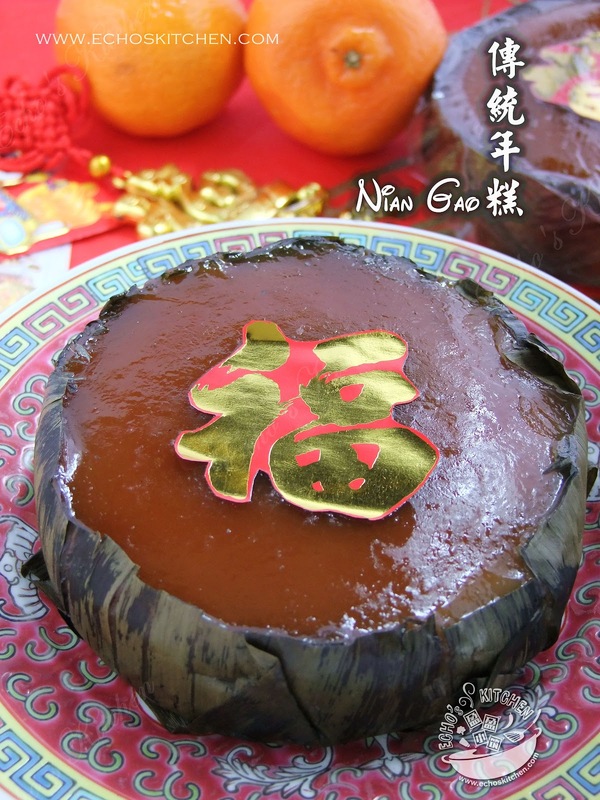 Nian Gao is normally used for prayers in Chinese New Year, a well steamed Nian Gao can be stored for months without being refrigerated. 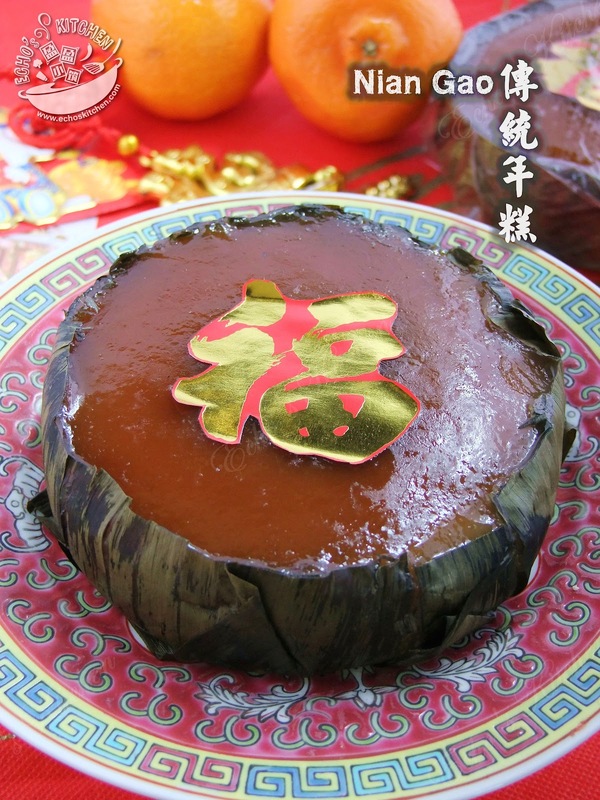 Even though there are many short cut recipes of Nian Gao circulating around the net nowadays. I still find it imperative to preserve the traditional way of making it. 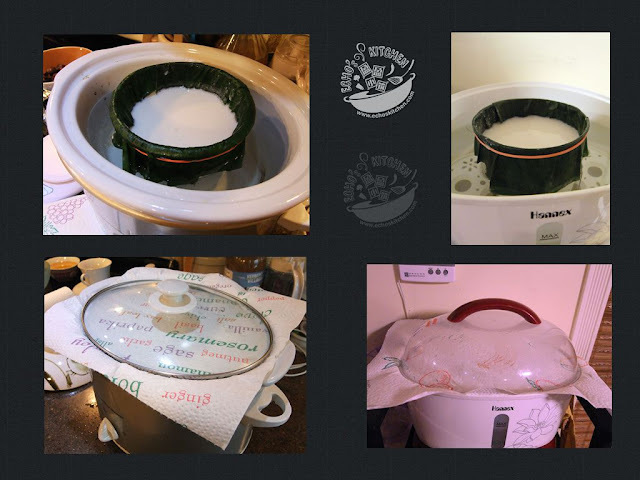 Though I can't stone grind my glutinous rice and steam cook using fire woods, I do managed to replicate the process as closely to the origin as I can with the aids of blender and slow cooker. I have to say that I cannot be more pleased with the result! 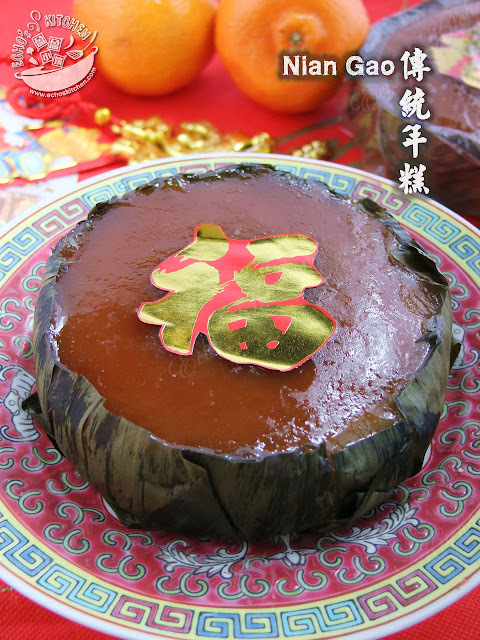 Here I am, together with my family heritage -- Nian Gao, wishing everybody a prosperous and healthy year of Monkey! 1. Wash and soaked glutinous rice for at least 4 hours. Grind the rice together with sugar with 1/3 cup of water (no more than that). Note: If your mixer is not so powerful, you can mix the rice and sugar before grinding, the sugar will liquefy during the grinding process, which will aid in grinding. 3. 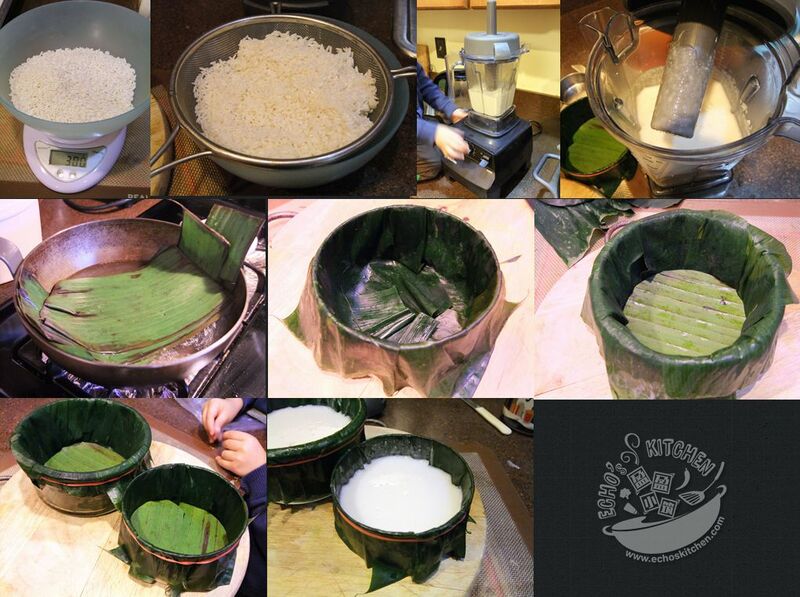 Line banana leaves around steaming bowls by overlapping the pieces and place a round shape of banana leaves at the bottom to further secured the leaves. 4. Use a rubber band or cotton rope to secure the leave around bowls to avoid deformation/shrunken of the leaves during steaming process, which could then resulting in out of shape cakes. 3. 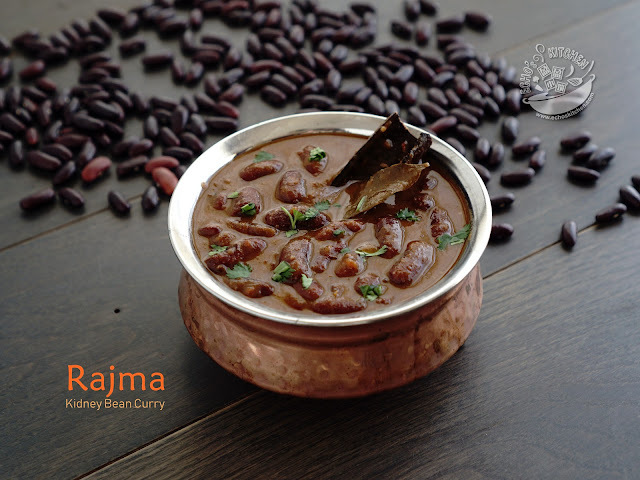 Heat up the slow cooker / steamer, pour rice mixture into steaming bowls lined with banana leaves, leave around 1 inch of space for the cake to expand during steaming. 4. Place a bigger bowl upside down in the slow cooker to raise the height so that we could add more water for long hours of steaming. Place the steaming bowl on top and add boiling water to the crockpot up to about 80% full. 5. Lightly place a clean towel or kitchen towel over the cooker before putting the lid on to prevent water dripping on the cake. 6. Steam cook the cake at high (On crockpot) and medium low on steamer for 13-16 hours (I steamed mine for 15 hours) until the cakes become amber in color (Caramelized) and the surface become smooth. 7. Remove the cakes from cooker and let cooled for about 12 hours before removing from steaming bowls.